Many games have demonstrated great attention to detail in, for example, recreating WWII, and games like BioShock have explored philosophical ideologies like Objectivism. L.A. Noire's great achievement is doing both: Featuring specific details culled from research and original cases inspired by the time period in which it is set, the game successfully weaves together a compelling narrative and a rich historical context without sacrificing one for the other. The late 1940s are a unique era in United States history. Superficially, everything seemed great. Soldiers returned from war, and women returned to the home. Rationing was over, and everyone had savings ready to spend. The 18 years of economic struggling was finished, and people were ready to enjoy their hard-earned peace. The G.I. Bill promised educational and home-owning opportunities, and racial tensions seemed be non-existent. The reality of 1947, though, was that organized crime was still powerful from Prohibition. Racism and sexism pervaded society, though perhaps not obviously to white, middle-class men. Paranoia about Communist threats domestically and internationally drove government policies. It's in this seemingly golden era that ex-Marine, newly-minted LAPD Detective Cole Phelps investigates the dark, dingy, hidden places of Los Angeles. 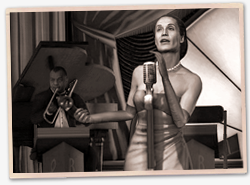 On its most literal level, L.A. Noire features many specific elements taken directly from the 1940s. Gangsters like Mickey Cohen, Johnny Stompanato, and Jack Dragna were major figures in organized crime in 1940s Los Angeles. Cars are also lifted directly from the era, as were the films featured in the collectible Gold Film Reels. Landmark buildings featured in the game did exist in the 1940s (except the Intolerance set), and most of them still stand today. The clothes, weapons, and interior design are all directly from the period. Tiny technological details create contrast between the 1940s and today. Radios play a crucial role in several cases, since televisions weren't widespread yet. Dialogue mentions that home refrigerators, a fairly recent home appliance, had put ice companies out of business. Trains and buses are more popular for out-of-city travel than planes and cars. The absence of the internet (or even two-way police radios) means Phelps has to call R&I dozens of times by phone to get basic information like addresses. GPSes don't exist, but that's okay because Phelps' partners share a mastery of L.A. streets that rivals Google Maps. Similarly, social and political nuances add a rich texture to the setting. Layaway is more common than buying on credit. Kelso mocks Phelps' desire to be Sergeant Alvin York, one of the most decorated soldiers from WWI, but a stranger to most Americans today. References to RKO, Republic, and Warner Bros. as major film studios are historically accurate, as is discrimination against Okies (migrants who left Oklahoma during the Dust Bowl for better opportunities in California). Anti-communism didn't intensify until China became communist in 1949 and McCarthy led the House Un-American Activities Committee in the 1950s, but L.A. Noire correctly references the Kremlin, Red Squad, Fifth Column, and fellow travelers in the immediate post-war era.